Depending on which version of Office you have, you can use an Office library of clip art, or get clip art from the web. Which version of Office are you using on your PC? 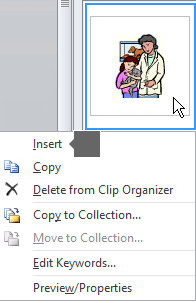 In Office 2013 and newer versions, there's no longer a clip art library, but Office still helps you insert clip art. Type a word or phrase to describe what you're looking for, then press Enter. 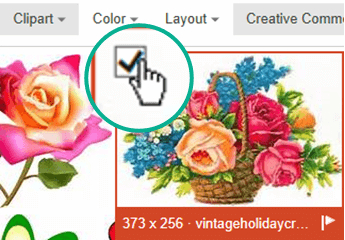 Filter the results by Type for Clipart. The image is inserted in your Office document. 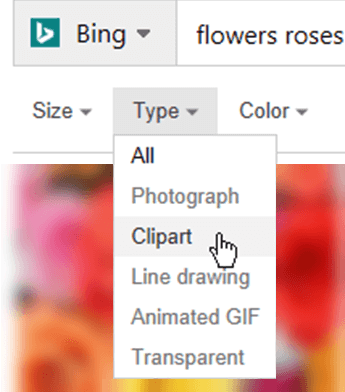 When using pictures or clip art from Bing, you're responsible for respecting copyright, and the license filter in Bing can help you choose which images to use. 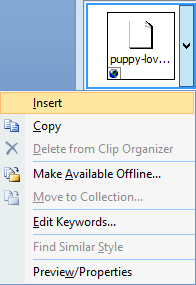 Another option is to install an Office add-in named Pickit that puts free, licensed clip art in Office. Click a section title below to open it and read detailed instructions. Open the Office app you want to add Pickit it to (Word, PowerPoint, or Excel). On the Insert tab, in the Add-ins group, select Store. The Office Add-ins dialog box opens. In the dialog box, use the Search box to look for Pickit Free Images. Click the Add button for Pickit Free Images. Close the Office Add-ins dialog box. Pickit may take a few moments to be "loaded" into the Office app. When it's done, a message appears at the bottom of your app window telling you so. On the Home tab of the Ribbon, in the Pickit section at the far right, select the Free Images button. 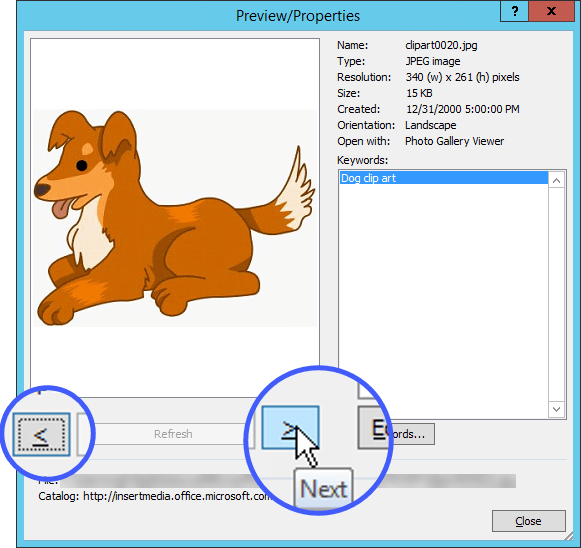 The Pickit Free Images task panel opens on the right side of the application window. On the pink toolbar near the top, use the second tab, the Pickit market, to browse for images. There's a search box (callout A in the picture) where you can type keywords such as flower, clipart, and business. A set of featured collections (B) just below the Search box. The set includes a Clip Art Characters collection. There are 25 collections (C) organized by Pickit. There are numerous user collections (D) to browse. 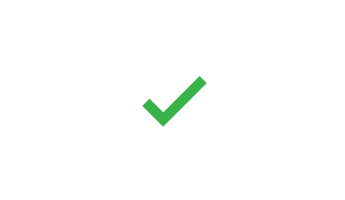 There are 35 categories (E) of images (such animals and pets, cities and places, music and instruments, and transportation) you can choose from at the bottom of the task panel. Icons are ready-made images that you can insert, pivot, rotate, color, and resize (with no loss of quality). To read about icons, see Insert SVG images and icons. 3D graphics look alive and can be rotated to any position you like. To read about these 3D images, see Get creative with 3D models. 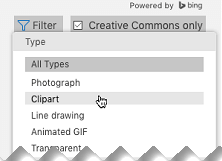 On the Insert tab of the toolbar ribbon, in the Images section, select Clip Art. The Clip Art task panel appears on the right side of the application window. In the Search for box, type keywords that describe the art you're looking for. Select Go to start the search. The search results are shown in the task panel. You can scroll vertically if the results don't all fit in the task pane. To see a larger version of a thumbnail image in the result list, or to simply see the image if all that is shown is a small red x placeholder, right-click the thumbnail and select Preview/Properties. 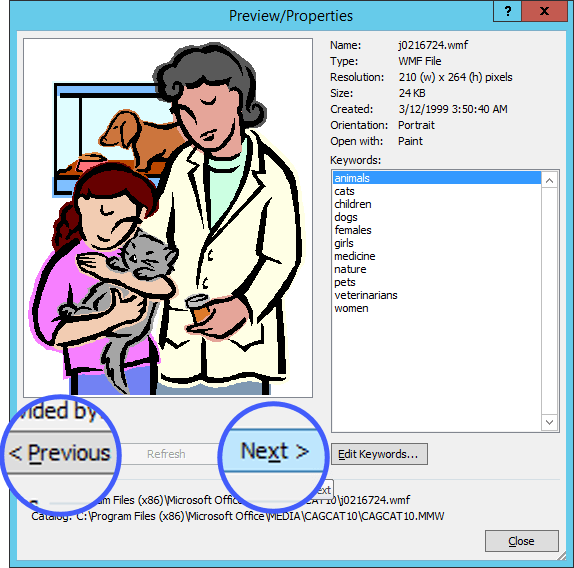 While you're in the Preview/Properties window, you can browse through the images by selecting Previous and Next. 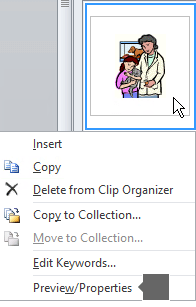 To insert a picture in your document, right-click the thumbnail image in the task panel, and select Insert. Once the image is inserted, you can adjust its placement by selecting it and dragging with the mouse. 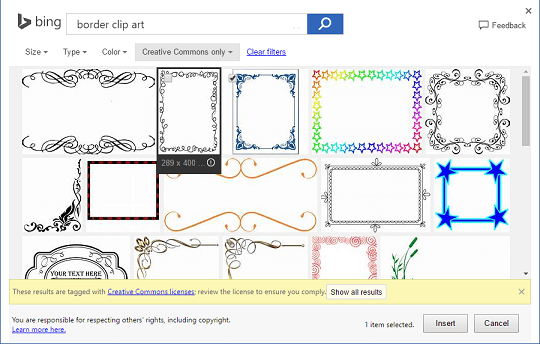 When you search for clip art and pictures online, you'll be directed to Bing. You're responsible for respecting copyright, and the license filter in Bing can help you choose which images to use. * Bing Image Search filters are based on the highly respected Creative Commons license system. To better understand the licensing options, see Filter images by license type. 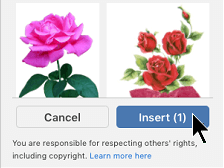 You're responsible for respecting the rights of others' property, including copyright. 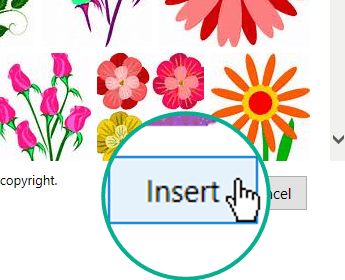 Beginning with version 16.19, in Office 2019 for Mac and newer versions, you can go on the web to find clip art and other pictures. Click Insert > Online Pictures. In the Search Bing Images box, type words describing the kind of picture you want (such as border clip art), and press Enter. Select the image you want to insert, then click the Insert button. 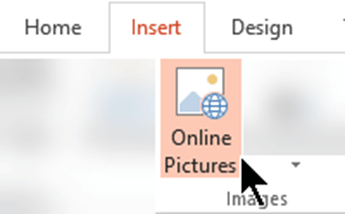 Insert > Online Pictures isn't available in Excel Online. 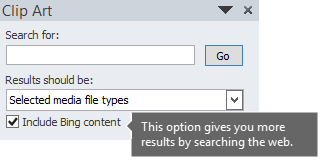 Excel Online only supports inserting picture from your computer. Looking for information about adding an audio clip to a slide? See Add or delete audio in your PowerPoint presentation. If an online clip art library is a feature you'd like to see brought back to Office, please send us your feedback.